You can duplicate assignments, graded discussions, and pages in a module within a course. When a module is copied, the word Copy is added to the end of the module. Duplicating a module defaults the copied module to an unpublished status. Assignment duplication, page duplication, and discussion duplication are currently supported in modules. Please note the exceptions associated with each item type. Items duplicated in the Modules page follow the same behavior as a new item created in a module. The item displays in the Modules page but is also visible in the item's respective index page. All assignments, pages, and graded discussions within the copied module also include the word Copy at the end of the module item name. Quizzes—Only Quizzes.Next quizzes are supported for copying within modules. If a module contains a quiz created by the classic Canvas quiz tool, the option to copy a module does not display in the module menu. Modules can be copied by removing the classic quiz from the module. Classic quizzes are indicated by the quiz icon; Quizzes.Next quizzes are indicated by the assignment icon. External Tool (LTI) Assignments—A module cannot be copied if it contains an external tool (LTI) assignment. If a module contains an external tool assignment, the option to copy a module does not display in the module menu. Modules can be copied by removing the external tool assignment from the module. The only exception to LTI tools is Quizzes.Next. If applicable, the Modules page displays any Blueprint Course icons after the page is refreshed. The content in a MasteryPath module can be duplicated, but the duplicate will not retain the MasteryPath. If you have set prerequisites or unlock dates for modules, they are not included as part of the duplicate. Locate the module you want to duplicate and click the Options icon . Click the Duplicate link . Note: If a module cannot be duplicated, the Duplicate link will not appear in the Options menu. View the duplicate module in the Modules Index Page. 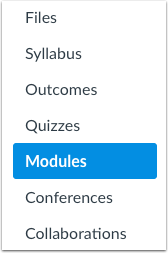 Note: If applicable to your course, the Modules page displays any Blueprint Course or Sync to SIS icons after the page is refreshed. Previous Topic:How do I add a module? Next Topic:How do I add prerequisites to a module? Table of Contents > Modules > How do I duplicate a module? Re: Can I duplicate entire modules for multi-week courses?